Now that the game is up on Steam and itch.io and I've had some time off from dev-crunch-mode, I'm adding in a feature that was always on the back burner: a multiplayer arena. The game's controls will (I think) lend themselves to a very engaging multiplayer experience. The dynamics in place (shoot, chop, 'nade, eat, vomit) generally lead to chaos in singleplayer mode, with explosions launching body parts, fire spreading around, and at times emergent gameplay that still makes me laugh. Thus, I feel that creating a local multiplayer mode will lead to an even higher degree of chaos and hilarity. What the arena currently looks like... soon to be other characters rather than 3 Reginalds. I've been working on replacing the player's scripts with arena specific scripts, and moving all of the player's data onto the player (the initial Unity tutorials I used hooked up player health, ammo etc., on the HUD elements, strangely...). I've also had to modify some scripts like "edible" and "flammable" to add language to address arena player objects. This way I don't need to create all new enemies, edible items, etc. just for the arena. I keep returning to the singleplayer game to make sure I haven't broken anything! I've almost finished refactoring the needed code, and the next big step is abstracting out the controls. Ideally, when I am done I'll be able to enter button strings on each character that correspond to whichever controls I wish to assign. On top of all of this, I'll be creating an arena menu screen that will allow players to choose the level, their characters, perhaps game mode (coin hunt, deathmatch, co-op coin hunt, etc. ), enemy spawn rate, and item spawn rate. Putting that all together will involve some new concepts structurally that I have not tackled before, so it will be learning process (which for me is a driver, creatively). As soon as I had death, respawn and basic controls in I couldn't help but create a pile of Reginald corpses! I'll keep posting updates as the arena comes together! Once I have the overarching menu and settings complete I'll be well on my way and likely update Steam and itch.io with a "beta" arena. The most satisfying process creatively, I think, will be adding levels, new items, characters, etc., so I'm working to get past all of this initial assembly (which is still quite fun!). Reginald Does His Thang has released! I plan to write a more detailed post-launch wall of text soon, describing some of the challenges and various aspects of getting the game ready. For now, if you are a Windows user, grab a copy if interested! I've been editing a bunch of game footage down into short, narrative trailers, and I enlisted the help of my friend Ian (actor/voice actor) to record some narration tracks. It was great to hear the scripts emerge through his voice work... now to finish editing the trailers! These are the last elements remaining before I can make the Steam Coming Soon page public, which will hopefully be within a week or so. Reginald pauses to contemplate the potential futility of the task ahead of him. Since March I've been working through level design, and I can finally say that all of the game's levels are complete! Once I had all of the cave mechanics and art it was head-down into the content trench, and now I can start working on the final area - the encounter with Grampinald. Meanwhile, the bugs/tweaks/improvements list grows, but I think the end is actually in sight. Shooting for a release around October or so! Knowing that I'll need to have plenty of resources for Reginald to eat in the caves, and that he'll need to use both ice and fire vomit to varying effect, I decided to create stalactites with fire and ice crystals inside. They fall after a second or so, and drop the crystal for Reginald to consume. Like the knights - incorporating a resource into a hazard. Once I rounded out the initial cast of enemies in Reginald, I started to realize that the game lacked a slow yet tough character for the player to grapple with. So about a month ago I designed a knight character and worked out all (or, most) of the kinks. The knight has much more health than other enemies, its attacks deal damage almost equal to 100% of the player's health, bullets bounce off the armor (and back at the player) and grenades, while still doing damage, do not explode on impact as they do with other enemies. Completed, I put the knight down and worked on other areas of the game, a couple of levels and random polish/improvements, as I was not yet to the actual level that would introduce the enemy. I recently started designing the level, and immediately was faced with an issue: the player can simply jump over the knights, avoiding them entirely. What's the reason to engage them? The player can generally avoid other enemies, but as some of them fire bullets or shoot grenades they present a more kinetic challenge. Also, I wanted there to be motivation to take down the knights, as they are challenging enemies and fun (I think) to engage. I upped the coins that the knights drop, but I felt this wasn't enough motivation. The Kuru Cafe, purveyors of the finest ice and fire pies. Concurrently, very near the level that introduces the knight there is a cafe where the player can purchase and consume a couple of items that grant temporary fire or ice vomit. Fire being a mechanic that has been introduced already, yet ice a mechanic that I was contemplating how to introduce within the next few levels. These mechanics let Reginald attack enemies in different ways, but also open up new paths inside levels and the hub world. What was the best way to introduce the ice mechanic, ideally before the next area of the game (which will rely heavily upon it)? I realized I could combine these two design considerations together by creating two different knights - fire and ice knights. When defeated, Reginald can consume the heart of either for fire or ice vomit, and combined with restrictive level design, I suddenly had my reason to engage the knights. In a sense, they are items. In the level that introduces them, one recipe page (the "collectible" of the game) is past a large fire, and the other requires burning down a bridge to access. As a bonus, this introduces the ice mechanic organically and lets the player discover its usefulness without using any sort of tutorial. Boom! Game design! Or something close, at least. I've been meaning to add some interesting background assets to the parallax scrolling system, and figured planets and moons would be a good start. Pretty easy to draw and adds a lot to the look of the levels! Have I made the knight too powerful? A strange looking bear creature scratching it's head? Or have I been staring at pixel art for too long? ... a magma longpig which explodes when it dies, and lays some sort of magma egg? This week I've been working on building out the mines section of the hub world, which opens up after Reg has collected a certain number of recipe pages. Next I have to actually make the levels! I've found myself getting into the habit of adding one last challenge to the end of levels. I plan to make at least one level per area a "double black diamond", which will be much more challenging than the other levels in the area. Currently working on the interiors of the various characters that inhabit Reginald's world. They'll chat to Reg about longpigs... kuru... vaguely dark references to future plot points... I'm not sure they'll serve a purpose other than world development, but I think that's fine! While spikes pose the classic game hazard to Reginald, his corpses remain after being impaled. In this way he can move forward by subjecting himself to multiple reincarnations. Reg can also vomit on spikes to cover them for about 10 seconds, which is generally faster. 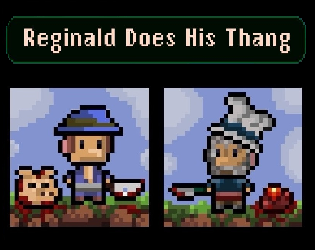 I hope to create a level where food is scarce, and Reginald's only way forward is to repeatedly sacrifice himself. I'm viewing lives not so much in the traditional sense, but more as "reincarnation stones", as having the ability to leave a corpse anywhere (and by extension, death) should be viewed as a positive characteristic and managed accordingly. Getting the basic animations down for a new character, in this case a molotov cocktail throwing punk. I'm using Aseprite for all my pixel art creation, which a relatively simple tool yet gets me what I need for the game's purposes. These are the basic animation frames for my humanoid characters: idle, walking, puking, attacking, and then the gib chunks. I've got fire implemented in the game which spreads dynamically, and this is will be the first enemy to implement it with their attack.